The officer who killed Ramarley Graham was allowed to resign. Support his family’s campaign to make sure ALL the other officers involved are fired. On February 2, 2012, 18-year-old unarmed Bronx resident Ramarley Graham was shot and killed in front of his grandmother and 6-year-old brother within his own home by then–NYPD Officer Richard Haste. Haste and several other NYPD officers broke into the family’s home without a warrant and against NYPD protocols, killed Graham, and engaged in misconduct and abuse of his family. After five years of failures by the local and federal criminal-justice system, most of the officers responsible for killing Graham, abusing his family or related misconduct remain in the NYPD and have not been held accountable. Haste was allowed to resign from the NYPD recently instead of being fired, despite being found guilty in his departmental trial, and having received tens of thousands of dollars in increased pay over the past five years since killing Graham. There were over 12 officers who engaged in misconduct related to Ramarley Graham’s killing, yet only two other officers are facing NYPD charges and the identities of others have been concealed by the NYPD. Officer John McLoughlin was on the scene with haste the day of the event, and he kicked in the door to the family’s apartment before Haste shot and killed Graham. Sergeant Scott Morris was the ranking officer on the scene, who allowed the unlawful entry and unjust killing to occur. While they both were slapped with internal charges, no dates have been set for their administrative trials and Graham’s family has been unable to get information about the charges against them. It’s this lack of accountability that allows police abuses and killings to continue in communities across the nation. Graham’s family is continuing their fight for accountability for his killing by the NYPD and related misconduct, demanding all officers responsible be held accountable and fired with transparency. Graham’s family and allies need our support now more than ever. Here are two ways you can join them in demanding accountability and transparency from Mayor de Blasio and the NYPD for Ramarley Graham’s death and the misconduct surrounding it. The mayor and NYPD must fire Scott Morris, John McLoughlin, and ALL the officers responsible for Ramarley Graham’s killing without any further delay, and release the information requested by his family. Making Ramarley’s family go through this after more than five years is disrespectful, and failing to hold all the other officers accountable makes our communities less safe. 2. The Nation has joined with Communities United for Police Reform to launch a petition echoing the Graham family’s demands that all of the officers responsible for their son’s death and the misconduct related to it be fired. Sign the petition below and then be sure to share it on Facebook and Twitter. 1. Sergeant Scott Morris and Officer John McLoughlin must have their trial start dates announced and be fired immediately. 2. All of the officers responsible for Graham’s killing and related misconduct must be identified and fired. It has been over five years since Graham was killed. 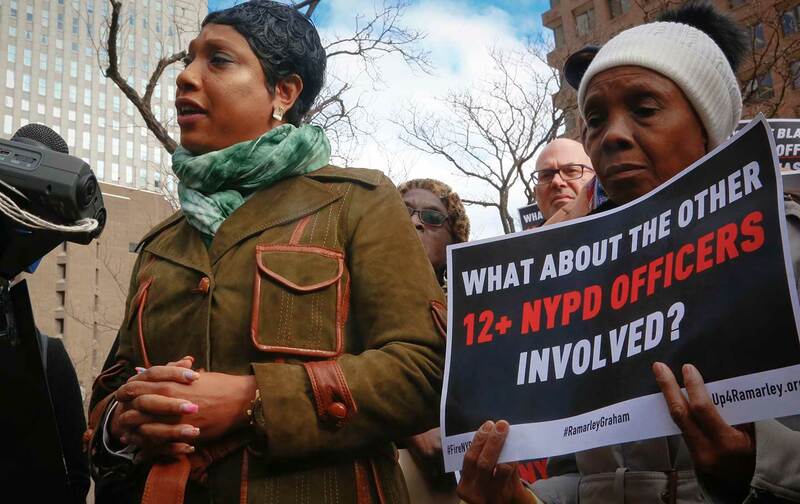 How much longer will you make the family wait for accountability from the NYPD?